At Volkswagen North Scottsdale, we’re committed to serving Phoenix, including its animals. We’re a supporter of HALO Animal Rescue and host an Adopt-A-Dog event here at our dealership every second Saturday of the month. Looking for a new furry family member? Make the trip from Scottsdale and meet the pups available for adoption! Not ready to adopt but want to help animal rescues in Phoenix? Read on to learn more about what you can do! HALO (Helping Animals Live On) Animal Rescue is a no-kill shelter with several adoption centers and associated locations throughout Phoenix, AZ. Although HALO is limited in the number of cats and dogs they’re able to rescue at any given time, they offer a comfortable and caring haven for their rescues until they’re ready for adoption. 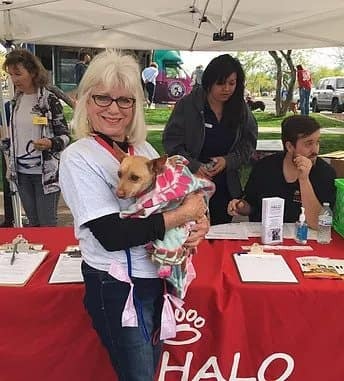 HALO works dedicatedly with other welfare agencies around Cave Creek to save perfectly healthy pets from euthanasia and place them in loving forever homes. Ready to join the fight in saving Phoenix’s pets? There are a number of ways you can contribute! Adopt: The main shelter is located at 3227 E. Bell Road Suite D151. You can also adopt from one of their other animal rescues in Phoenix. HALO has hundreds of adoptable cats and dogs who can’t wait to meet you! Donate: Make a monetary donation to help provide food, medical care, shelter, and homes for the animals. You can also check out HALO’s Amazon Wish List and donate items like treats, beds, medical supplies, and scrubs with just a few clicks! Volunteer: Whether you’re interested in fostering, volunteering, or group volunteering, you can contact HALO online or by phone to learn more. Volkswagen North Scottsdale is a Proud Phoenix Dealership! The team at Volkswagen North Scottsdale is dedicated to serving our customers, as well as the area in which we live. We believe in using our influence to help our community as a whole, especially those who can’t speak for themselves. Feel to contact us with questions!